Today’s been the first day in quite a while where I felt like I was finally able to breathe. Between being in D.C. this past weekend, Greek Sing yesterday, and the rush of the end of the year, something about this morning just felt good and refreshing. I’m hoping that you’re having some similar rest. I know social media can make it seem like everyone’s lives are ~effortless~, but trust me, I am a hot mess about 75% of the time. It’s all about celebrating the small victories and power naps. This week’s small victory: making three days of delicious lunches that I actually don’t have to put together the night before! 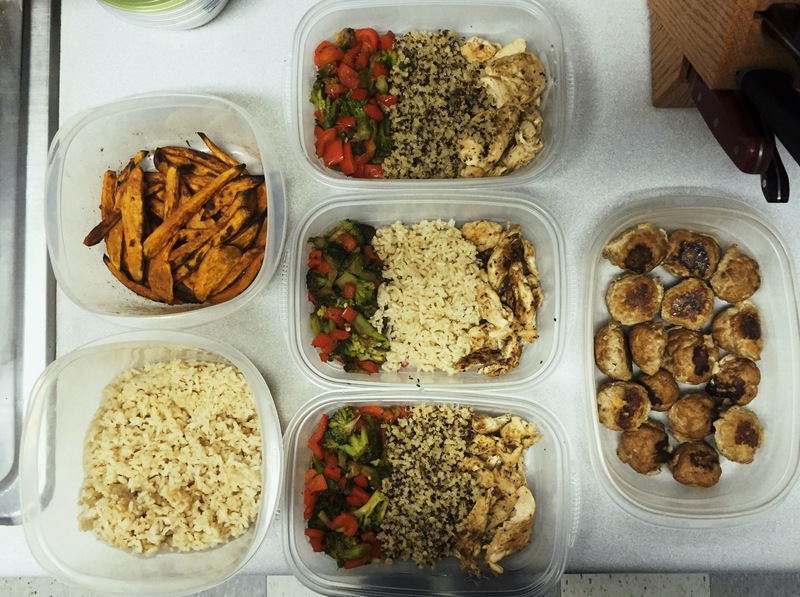 That middle row contains a red pepper and broccoli sauté, brown rice (middle) and quinoa (top and bottom), and some grilled chicken. I love salads, but wanted to mix it up a little this week. This is still a great combination of all the key things your body needs to stay energized. On the right I’ve got some turkey meatballs…but I kept it simple this week. Just a pound of ground turkey, some salt and pepper, a little onion and garlic powder, and a kick of Sriracha. Quinoa or peppers or sweet potato are great additions to this if you’re feeling fancy! I also switched up my sweet potato game and made baked sweet potato fries this week! I sliced them (and my finger), soaked them in water for about 45 minutes to remove some of the starch, then coated them in olive oil and baked them at 450 for about 30 minutes, flipping halfway through. Like I said last week, a wire rack probably would have made these crispier, but I’m not complaining: they were delicious with salt and pepper and a dusting of cinnamon. That’s all I have for today, folks! I know I mentioned this before, but I really want to take a moment and say a thing. So often our social media is used for self-promotion and to obtain affirmation (I am so guilty of this it’s not even funny). But today’s reminder to myself and all of you is that life is more than perfect #mealprep posts or Instagram-worthy nights with friends. If you spend tonight watching Netflix and ordering a pizza, YOU ARE DOING LIFE RIGHT. Seriously, as long as you are doing what makes you happy, you are exactly where you need to be. The world needs more people who aren’t afraid to live authentically, especially in the time we live in right now. Do you and be flawless.